A selection of independent schools are soon to take part in a nationwide pilot scheme being carried out by The Institute of Groundsmanship (IOG) as part of the launch of its new Pitch Grading Framework. The involvement of these schools will help inform the Pitch Grading Framework from a schools’ perspective before the scheme is rolled out. The concept has been supported by all national governing bodies of sport and aims to boost industry standards for grounds facilities, improve the knowledge within the sector and set benchmarks for playing surfaces. The framework will not only highlight the level of an individual playing surface quality but also the appropriate training and education, and the recommended levels of qualifications, needed by the ground’s management team who maintain it. This will allow a new way for schools to showcase quality sports turf facilities and recognise the skills and expertise of its grounds teams while adding a new dimension to attract potential students and their parents. Natural turf sports pitches standards will be graded from levels zero to five, with five being ‘elite’ status. Within this framework, grounds teams are advised to have a certain level of qualifications to obtain certification for each grade. Each level is complemented by a training and qualification recommendation framework that features specific and accurately blended learning, delivered both online and in the traditional format. The IOG Pitch Grading Framework will help to progress standards and provides an outline for how schools can take their facilities to the next level. 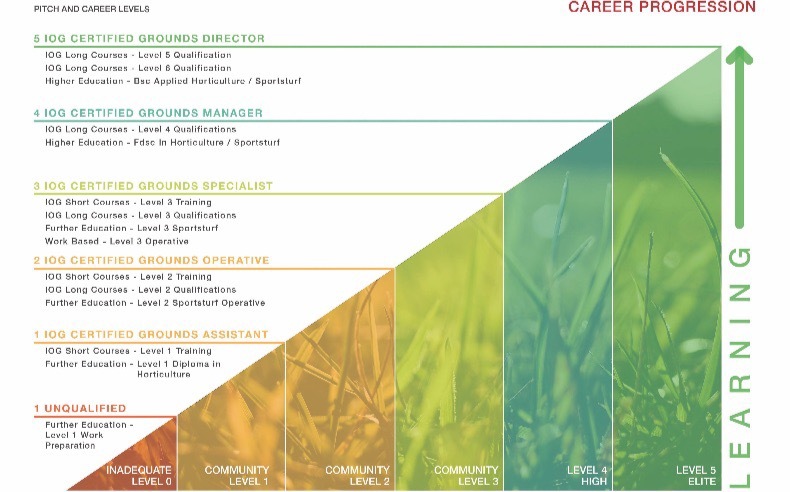 To aid this, the IOG offer site audits and training needs analysis services, as well a vast array of online and on-site training courses and qualifications to support the professional development of grounds staff. Another service is the training needs analysis. This unique service maps out a suggested training and education journey for team members to undertake. After assessment, schools receive a tailored education plan to help meet goals and Pitch Grading Framework targets by helping to determine the steps to be taken to raise the position of pitches on the framework. To take advantage of significant training and service discounts, schools must be a member of IOG. Independent school membership costs just £300 per year, which provides access to benefits for the entire grounds management team. This gives access to leading experts, resources, the latest industry science and knowledge, as well as discounted fees on training and qualifications to enable schools to create thriving sports turf surfaces that benefit their students, and in turn help to promote and showcase the schools’ facilities. For further information please visit www.iog.org or call 01908 312 511.